“Living On The Run” Available Now! 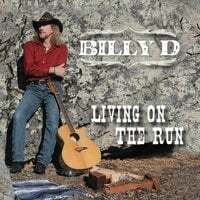 Billy D has just released his new album entitled” Living on The Run” Two years in the making with pre-production work, countless hours of preparation, and then down the home stretch for the final cut. Recorded, mixed, and mastered at Screaming Lizard Studios in Petaluma by Andre Zweers and Judy Kirschner both at the top of their game as major recording engineers at the Lucas Film Ranch. With the help of a few old friends contributing some fine slide guitar playing, mandolin picking, and some real fancy and sometimes mournful fiddling Billy D has managed to combine and mold all of these energies into his first solo album. Living On The Run CD Released!